4 Comments on Wanna Ride Bikes? Been riding bikes for most of my life, like many of you. I remember my first bike almost like it was yesterday; a screaming red Schwinn Stingray with banana seat and ape hanger bars. Or, at least I thought they were since I was 5. Learned to ride that thing **like a boss** too. Imagine how upset I was when I let it get stolen. It was soon replaced with a screaming yellow version of the same bike. And I rode that thing like a boss too. Forever. No kidding, like my car, I had that bike forever and rode it everywhere. It’s where I started with bikes. [This might sound familiar](http://donburnside.com/the-history-of-me-wheels/) if you’ve been a donburnside.com reader for more than a few years. Fast forward to this last weekend. [The Burnside Manor](https://foursquare.com/v/the-burnside-manor/5334dd3b498ebe83228b3a65) played host to the ‘rents as they needed to visit to deliver a few things. Namely some really _kickass_ (potentially) wine. And, the beauty you see above. 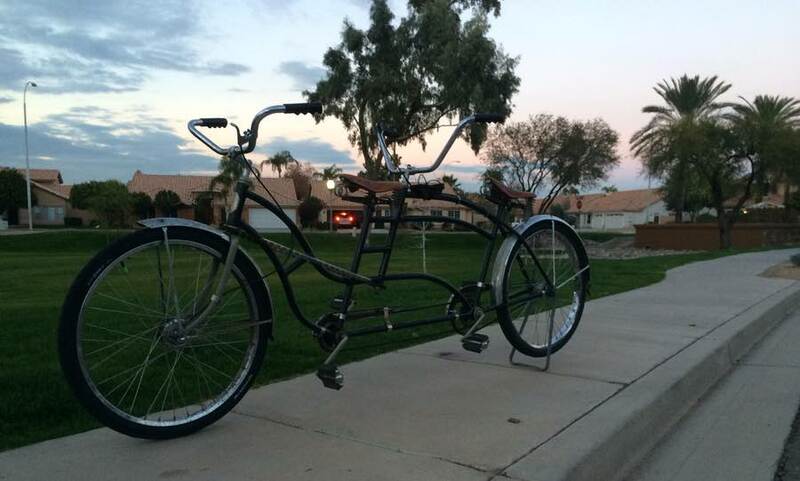 I haven’t fully researched the bike yet, but I do know it is a Colson Tandem, built sometime in the 40’s. Most of it, from what I can tell, is original, like the seats and fenders, the frame and the wheels. Again, I only think. It’s got an internal front brake, coaster brakes and a 3 speed that mostly works. It was delivered with rotten tires and tubes, quickly replaced day of delivery so I could get out and ride it. I remember when this bike first came into my life. It was at Newport Beach. Grand dad picked her up and made it part of the beach house bike stable. There were always very unique bikes in that collection. This one quickly became a favorite. Not because you could ride it with another person, which is cool to be sure. It’s that you can ride it by yourself. Yea, this particular tandem bicycle allows for 2 person steering. Since both riders can steer, 1 can drive from the back without a front seat passenger. Took it for a ride around the hood last night and got some interesting looks, since I was riding from the back. Don’t worry, I’ll get video soon enough. It’s a cruiser to be sure. This is not what you would consider a speedy bike. It rides so low that if you turn too sharp, the pedals will scrape the ground. But, high speed turns with big leans aren’t what this bike it about. It’s about the ride, baby. She is comfortable to ride and a joy to pedal. With as much weight as she carries, once you get moving the momentum just keeps it going, smooth and comfortable over the bumps. This is my next project. Getting it cleaned up and tuned up. Like I mentioned, she is rideable now. After a few minor things, she’ll be ready for anything. No sir! Myself and anyone I designate is engine enough. Also, should be painted brown. Negative ghost rider, that pattern is full. She’s got some rust on the chrome that I’m going to attack with Navel Jelly. Otherwise, she’s staying just like this (minus new pedals).